Convert normal/scanned PDF and images to 15 popular document formats like Word, Excel, PPT, Keynote, Pages, etc. 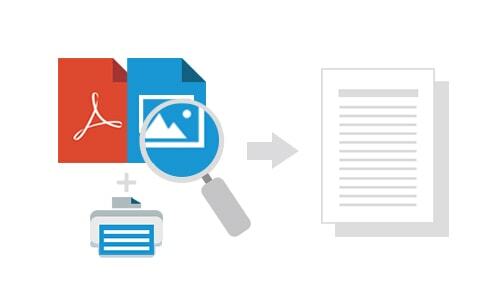 Need to rework a PDF document, but all you have is a scanned PDF file or Image? No problem. Use the best PDF OCR Converter for Mac to view and convert any scanned PDF into editable and well-formatted Word, Text, PowerPoint, Excel, Rtfd, ePub, HTML, Keynote, Pages, etc. and create editable text files from image-only PDFs. With Up to 49 languages supported for text recognition, it is the most handy and convenient PDF OCR converter tool for everyone: home users, business users at work, and educational institutions. And today, it's ON SALE for 75% OFF, you guys cannot get lower price any more! · Convert PDF files to editable MS Office Word, PPT and Excel documents. · Extract text from normal and scanned PDFs to save in Text or Rtfd files. · Creates E-books in EPUB formats for tablets and portable readers. · Convert PDF to HTML to publish and share PDF content on the web. · Convert PDF to iWork files (Pages, Keynote) for use in other office editor apps, such as Pages, Quick Office, or Keynote. Works as a PDF to Image Converter which lets you quickly convert PDFs into a wide variety of image formats including jpg, tiff, png, bmp and gif. Now, you can enjoy viewing eBooks in picture viewers without PDF reader. · Accurate reconstruction of document structures, layout and formatting across multiple pages – including headers/footers, footnotes, table of contents, page numbering, captions, etc. · Applies advanced OCR features to complex conversion tasks. · Professional OCR results with up to 99.8% character recognition accuracy. 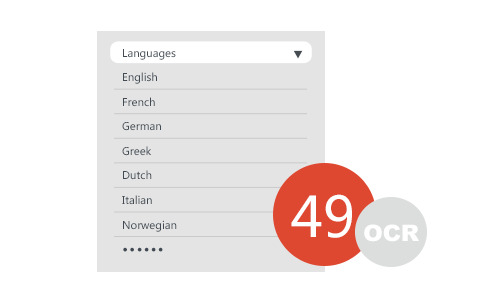 · Supports 49 OCR recognition languages: English, Polish, French, Italian, Greek, Russian, German, Turkish, Chinese and more. · Supports converting scanned or normal PDF files composed in multiple languages by selecting the option “Choose Multiple Languages" first. · If the PDF is protected by an owner password, you can convert the PDF directly, no password required. Owner password: Password used to protect PDF files from editing, copying and printing. · If the PDF is protected by a user password, you need to enter the user or open password to convert. User password: Password used to protect the files from opening. · Extracts the text, tables and pictures from scanned PDF to manageable and searchable documents. 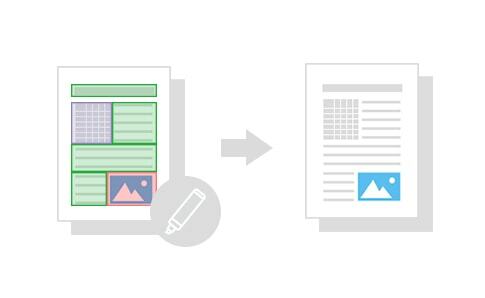 · Automatically marks every part of a loaded PDF or image in a different color based on the nature of a given part. Or you can do more delicate handwork on PDF or image files with 4 options: Select, Mark Texts, Mark Images, and Mark Tables. · Extremely fast, convert a 100-page file within a minute. And it may take a longer time when the OCR system is enabled. · Preview the current page in real time, does not require having PDF reader installed. · Very easy-to-use experience, drag-n-drop supported. "Works perfectly and accurately. I am glad I found it! It does all that I need and does it efficiently. Well done. And I will tell all my Internet friends and business associates about your product." "I purchased this app to get text from scanned PDF files in order to use them for my PPT. Good conversion without losing quality. I’m very satisfied." "Being a Realtor and having to working with scanned PDFs and images nearly every day…. This program is a LIFESAVER!!!! I can’t imagine being without it! I was not expecting this to be so easy. Thank you! Will be looking at your other programs… when I have more time." Mac OS X 10.7 Lion, Mac OS X 10.8 Mountain Lion, Mac OS X 10.9 Mavericks, and Mac OS X 10.10 Yosemite. Trial works well on three pages. @LottieL and @dcannis we had a problem with Paypal pinging MZ back. The problem has been solved and your purchases and serials should be in your accounts! Sorry for the inconvenience! Code has arrived and all’s well with the world. Code has arrived me too. I’m very impressed with the trial results. It produces terrific output to MS Word from pdf’s with selectable text, as well as a scanned pdf such as from my photocopier. Images seem to be handled faithfully too. I notice the Keynote and Pages output is for Keynote ’09 format. Are there plans to implement the newer format?